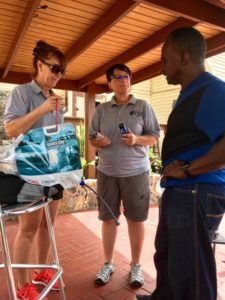 Rotary Club of St. Thomas East will distribute free water filters Tuesday, Wednesday Thursday and Friday at locations throughout the U.S Virgin Islands as a disaster project with St. Thomas Reformed Church. Tuesday, the club is distributing filters at E’s Tea Garden on Garden Street on Tuesday from 7:30 to 8:30 a.m.
Wednesday, they will be distributing in the upstairs of the former hardware store in Red Hook Plaza at 6 p.m.
Thursday they move to St. Croix, giving out filters with Rotary St. Croix at Gertrude’s Restaurant at noon. Friday St. John gets filters, in conjunction with Rotary Club of St. John, in Coral Bay and Cruz Bay. Times are still to be announced. Corinne Van Rensselaer, the coordinator of the water filter project said she believes water quality and access to clean drinking water in the US Virgin Islands has been a long standing three-fold issue which could be mitigated if water filters were readily available, easy to use, and didn’t need frequent maintenance or replacement. “When people must purchase bottled water year round, there are financial, health and environmental consequences,” Van Rensselaer said. “Those consequences are magnified for individuals living in lower-income housing where in-line or countertop water filters are out of their financially reach. Realistically, these people only have two options: boil water from the tap or purchase all of the water they consume. Filters allow individuals to quickly, inexpensively and safely obtain water without adding significant plastic waste to the landfill.,” she said. Van Rensselaer said she believes the PointONE brand 0.10 Absolute Micron Water Filters, produced by the Sawyer Products Company which Rotary is giving away is a potential solution to this long standing challenge. The filters are a quality product … Sawyer’s own product description indicates they are the most technologically advanced solution for water filtration and were developed using advanced kidney dialysis filtration technology,” she continued. Funding for the current distribution was obtained through a Rotary District 7020 disaster grant. The Rotary Donor Advised Fund for Hurricane Relief provided $14,000 to help pay for the current project, with RCSTE contributing an additional $2,500 towards the project’s total cost. University of the Virgin Islands’ Water Ambassador Program Champion Christina Chanes provided another $2,000 as part of the school’s Cooperative Extension Service’s clean water grants. years ago during a Rotary 7020 District Conference. The Rotary District 7020 has partnered with the company for years and has conducted multiple water filter projects with them. Greg Keen, owner of Sawyer Products, the company that makes these highly specialized water filters is making his first trip to St. Thomas to witness the distribution of filters to V.I. residents. The Sawyer Products Company is an outdoor recreational manufacturing company in operation since 1984. It produces and sells products that protect against the damage from the sun, bugs, water and recreational injuries. The company has partnered with Rotary Clubs and others over the years and as a result of this experience has recently redirected its mission statement. Sawyer’s approach now is to be a profit making company in the USA outdoor recreation market solely for the purpose of bringing safe water to the rest of the world. With this unique new business model the company is now dedicated to providing filters for humanitarian efforts at cost or below. It was Pastor Andy Topp, a Rotarian from New Jersey that has been the catalyst partner for the current project. 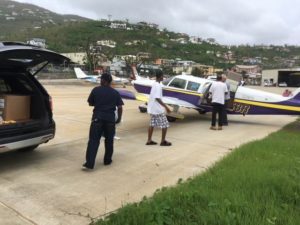 Topp contacted Van Rensselaer after delivering a plane full of water filters to Virgin Gorda after the storms in September. Topp reached out to Van Rensselaer to see if Rotary might be interested in obtaining filters for St. Thomas. Next week’s visit will be Topp’s third visit to the US Virgin Islands. In the past, donations from Rotary of St. Thomas Est, Nazareth By-The-Sea Church and Topp’s own foundation, the International Humanitarian Aid Foundation, made it possible for him to deliver two plane loads of filters to the VI last fall. At that time about 1,500 filters were distributed to residents in St. John., St. Croix, St. Thomas and in the BVI through churches and community distribution centers. Rotary International, a world-wide service organization with well over 1.2 million members has developed six areas of focus which all Rotary Clubs are expected to aim their public service projects towards. Those areas of focus include: promoting peace; fighting disease; clean water, sanitation and hygiene; saving mothers and children; education and literacy; and promoting local economies. This story seems to indicate the water is not safe to drink, but there is no reference to any problem with water quality. WAPA is required to test and report on water quality, so it would be helpful to include information about water quality.